We have a lot of these in our family and we’re about to get two more, from one daughter. Birdie is going to graduate on May 7 with two degrees, one in Athletic Training and the other in Exercise Science. Not that the rest of us never worked hard for our degrees, but the amount of hours that Birdie has had to put into her majors is CRAZY! She has spent, literally, hundreds upon hundreds of observation hours in the training room, on various sporting fields and events, and even in orthopedic surgeries. The courses she has had to take would easily prepare her for med school. And she loves it. Whenever she talks about some type of injury she uses those big words that none of us understand causing us to, repeatedly, ask her to ‘dumb it down’ for us. Whenever more than one of those Athletic Training majors get together, they sound like they are communicating in a secret language that only they understand. The rest of us have degrees in the arts, or social sciences, or education. We know nothing at all about anatomy, physics, diseases, injuries…but Birdie does. And she knows a lot. We come from family who believes, strongly believes, (ok, we might hinge on the fanatic side) in the value of a good education. Both sets of my grandparents believed in education. My mother’s parents stated, without hesitation, that “your education is not over until you have that college degree in your hand.” My parents passed that on to me, and I passed it on to my girls (although they did have one advantage that I didn't, they knew it was also ok if they didn't want to go to college. Oh, and that sound you hear? That's my grandparents rolling over in their graves at that statement). And it worked- we are 4 for 4 on daughters who attended college. Our two youngest daughters are there now; one is graduating in May and the other, the last one, the baby, is finishing up her sophomore year and is an education major. Between my mother, her sister, my four daughters and I, we are holders of 7 bachelor degrees (9 on May 7th); 3 masters’ degrees; and one PhD. And we are proud because we poured a lot of time and effort into those degrees—some of us poured a lot of alcohol during those years as well, but that’s another story altogether. The funny thing is, although I am very appreciative of my own degrees, it pales in comparison to how proud I am of my girls. All of them have/will have more to show for their degrees than I ever did. They worked harder, played harder, and were/have been/are WAY more involved in activities (sororities, sports, counsels, leadership roles, committees, etc.) than any of their predecessors. Not a day goes by that I fail to realize how truly blessed we are by our four lovelies. This group of education addicts just gets better with each generation. Oh, and don’t let Hubs fool you. Even though his parents did not shove instill fanatical crazy ridiculous over-zealous strong educational goals on their kids, he is one of the proudest fathers you will ever see at a college graduation. He’s the one behind the video camera with the puffed out chest swearing that he most definitely is NOT crying. Yeah, we’re saps too. This is the 1st day of the A-Z Blog Challenge for the month of April. I decided to try this challenge in the hopes of keeping some momentum going; getting my brain to stay warmed-up; and trytrytry to improve my writing--well, really, to find my voice. Just click the badge on my sidebar to join in the challenge! OH, and PLEASE go visit The LG Report and cast your vote for TUCKER in the cutest pet contest over there! Tucker says, "Woof! Woofy, woofin!" Which translates to: Please vote for me I really want to win that bag of treats! A GREAT BIG Thank you and HUGS galore to those of you who already have voted for the Tucky Bug! PS....I'm off to go vote for Tucker!! I had to chuckle that she is getting 2 degrees and my oldest is on the 5 year plan for 1 degree! As long as he gets his degree, I don't care how long it takes! Mary- Oh, I was on that plan myself! LOL I think I just had way too much fun during my college years! Do you know what I love best about this piece? - learning that you have a family tradition of smart and capable women. My daughter will also be receiving a Bachelor Degree this Spring, so I understand how proud you must be. Kara- And let's not forget opinionated and stubborn. LOL Congratulations on your daughter's graduation! Isn't this exciting?! Super post! Your pride and joy, once again, tangible to all! My parents and my husband's parents were the same, but we were not pushed/forced into attending university (college) and were told that 'that piece of paper' is only the beginning. 'Your education never ends!' I've tried to remember that, although everything came to a complete halt for me when I gave up my career to raise our two children from birth right the way through to university. My husband continued studying while our children were little (Masters, Phd. ), but NEVER EVER put me or the kids second. Desiree- I gave it up to stay home and raise the girls too. But isn't that where the real learning began? LOL I've always told my girls to be students of the world- and they all seem to be doing that too! It's no good if we don't continue to learn as we age. We will enjoy the festivities. She has worked so very hard! How wonderful! You must be proud. I think that is a fabulous thing your family has going with education. What a great post. My parents could not care less about my education. I thank goodness realized it was important and I am very proud of the fact that as a single mother of 4 I managed to receive (2) BA's. Changed my mind. This was the breakfast topic with the 4 grand daughters sleeping over. One said to the other are you going to go to "real" college or the online kind. I was hysterical. Ok, I voted for Tucker! Nico says hi and thinks he´s cute too. You can be so proud of your daughters. My parents didn´t even care that I finished high school. So I´m very proud of my daughters too, that they finished a college of their choice. I agree - education is important. I have 2 out of three with university degrees. The third has a different education - he's a chef. And he talks in a funny language with his cooking friends, too. I think our children learned so much more then we did. When my boys start talking business and IT, my husband & I just sit there and are hopelessly lost. They sense this and laugh and try to dumb it down. Without them we would know absolutely nothing about the tech industry and how to work our computers! 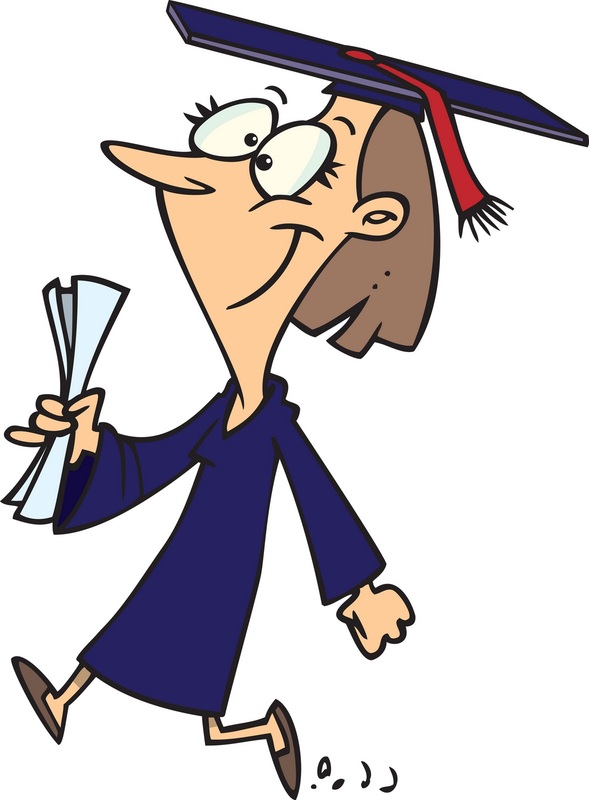 Doreen- I am in total AWE of you--getting TWO degrees AND being a single mom of FOUR? You are amazing! Betty- Tucker sends a big kiss to you and Nico! Isn't it grand having wonderful daughters that bring us so much joy?! Susan- Ah, the IT stuff...that's where Birdie's boytoy and BestSonInLawEVER come in very handy! LOL We told Birdie she can never break up with E because we NEED him! You're right, they do learn more than we ever did though, regardless of subject matter! I've got one an uni at the moment and the other is considering post-16 education at the moment. And you're right - kids do work so hard these days. Love the A-Z April bog idea - will have to investigate that one! Hearty congrats to your entire family, hubs too. Lots of work, and great achievements all round. I'm a great believer in education too, maybe that's why I became a teacher! I truly believe that education is what levels everyone, and brings equality in our world, breaks barriers, be they monetary, race, disability, gender. And that's why I think governments should invest primarily in education. We as parents do that too, from the first time we read a bed-time story to our little ones, to when we pay the last instalment in college fees. Oops, sorry for the long comment,lost the run of myself! Many congratulations to Birdie, and I can just imagine how very proud you and hubby are going to be at her Graduation Ceremony, and quite rightly so! I agree that education is such a wonderful thing. Charming-Do check out the A-Z challenge, I think it's going to be fun---LOL Congrats on the Masters! That's as far as I got---but I say go for the PhD...I would LOVE to do that myself! Mimi- I don't mind long comments. Especially one that is so passionate about education! And a HUGE thank you to you for being a teacher! This-It is wonderful! The ceremony should be nice...although they stupidly hold it OUTSIDE and in Charleston, that's just dumb because it's going to be HOT. WOW!!! We do not have anyone in our families that have done anywhere near what your family has done. We are hard working, self employed people that I think if possible probably would of attend colleges but never had the fundings available or able to pay back if did get them. It's mostly our area and none of us are willing to leave our families but I am very proud of you and your family and for all that they've done with their lives and schoolings. I love reading about you guys and all that you've done. You have an amazing family. What beautiful children you have and what accomplishments! I too agree in a college ed. even though now there are many different ways of achieving that! Thanks for the follow. Loved the post and not just because I'm a teacher. I think Birdie has the best of both worlds, an education in a way cool field (okay, I don't teach language arts..). I got a Masters after my credential classes, and as proud as I was, I couldn't compare to my husband's pride. He told everybody he met for about 6 months after graduation. Oh yes, I voted for Tucker, he's too cute. You sure have something to be proud of in your daughters. I agree with you about the importance of education. Julie- My mother's parents never went to college---Grandmother completed 8th grade and Granddaddy only went through some level of elementary school (they both grew up on farms and were needed on the farm). And yet, Granddaddy opened and owned a drycleaners and several Laundromats and, truth be told, both of them possessed more wisdom than the rest of us put together. But they are two of the ones who insisted on their daughters (and then me) going to college. So, I know just what you're saying. Alessandra-Teaching is one profession that I hold in high esteem! I agree that Birdie's field is awesome, I just can't communicate with her about it. LOL Thanks for voting for Tucker! diane-Thank you! They are all great gals!